Ever thought of having a pet gecko? You know, just a cute little lizard of your own that would talk Australian and try so politely to sell you insurance? I know you have, just like everyone else, however, let me guess…you’ve never had a reptile before and you haven’t the first clue as to how and what to do to keep, maintain and raise a mini-dinosaur. Am I correct? Well, let me be the first to tell you…Nothing Could Be Simpler! 1. Do you want a pet gecko? 2. Can you spare a few moments 3-4 times a week to feed a pet leopard gecko? 3. Do you operate an in-home shelter for stray cats? If you answered the first two questions “Yes”, then you’re a prime candidate and well on your way to being a master gecko keeper. If you answered “yes” to question three, well, maybe a gecko is not for you. Either way, let me tell you how easy it is to keep your own pet leopard gecko (Eublepharis macularius). First, I’ll cover some common concerns. No, geckos do not bite. It’s better described as an attempted oral grip. If your gecko does attempt a nip at you you’ll most likely just want to say, “Wow! 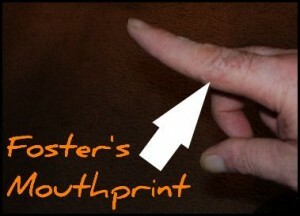 My gecko just bit me!” Something to bring up to friends over a beer, but nothing more. Let your gecko chew on your fingertip a couple times and he’ll soon realize you aren’t a cricket nor a mealworm and he’ll remember in the future you aren’t a meal. What in the heck do geckos eat? Two things: Crickets and mealworms. OK, crickets, insects and mealworms. That’s three. But crickets and mealworms are insects so, actually it’s one. …….. Eeeeeewwwww! I don’t like worms! Don’t fear, mealworms are not worms, but the larvae form of a beetle (Tenebrio molitor). 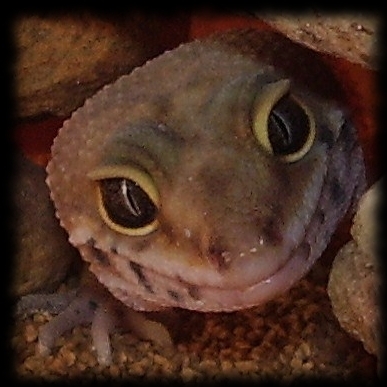 They (the mealworms, nor the beetle – or the gecko for that matter) are not slimy nor yucky. The just taste good to geckos (and are popular street fare for humans in Thailand). Eeeeeewwwww! I don’t like beetles! If your mealworms do metamorphosize (after several months of not being fed to your gecko) what you will have is one dumb beetle that can’t fly and if he tumbles over onto his back, he’ll most likely just lie there forever kicking his miniscule getaway sticks in the air in vain. An easy-to-hunt meal for your gecko. 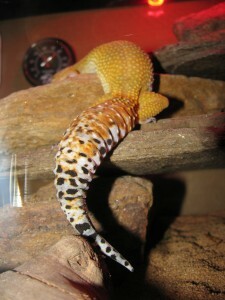 Won’t my pet leopard gecko poop everywhere? Absolutely not. As a matter of fact, leopard geckos may be the tidiest little homemakers in the animal kingdom. Once they move in and take occupancy of their new residence your leopard gecko will first take a long and thorough walk-through inspecting his/her new abode and then promptly designate one specific corner as its lavatory. All in all, poop is not an issue. How big do they get and how much space do they need? 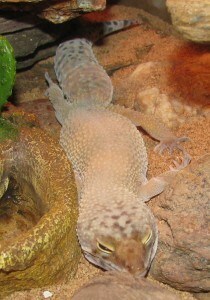 A leopard gecko can attain a length (from tip of nose to end of tail) of about 7 inches. 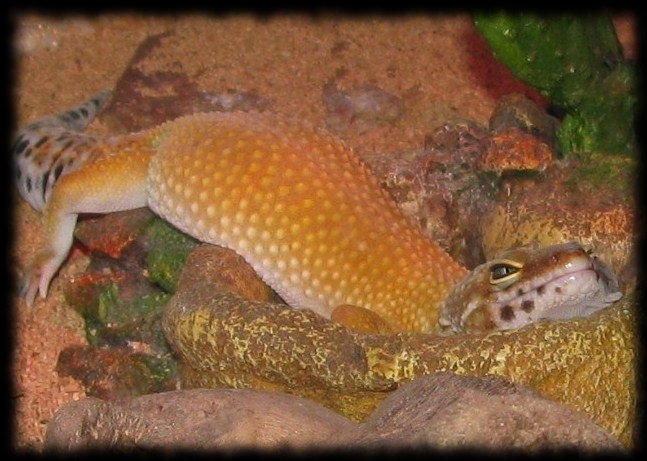 An adult leopard gecko will have more than enough room to live in a 20 gallon long aquarium. An aquarium with a screened top so the cats don’t get in, an overhead night light for heat, a sand substrate for reptiles, a water dish…and a gecko. Adults will eat about 6-8 crickets/mealworms per feeding, only need access to a water dish for infrequent sips, needs no grooming (IE: haircuts or nail clippings, although periodic baths may be a good idea), they do not bark or beg for food, don’t shed (well, actually they do shed their skin every few weeks, but they eat it so there’s no clean-up), are happiest being solitary rather than with a mate, are inexpensive, live long (can live 20+ years), and are fascinating to watch for hours on end (when they are not sleeping). Leopard geckos aren’t the most skilled of hunters and it is quite comical to watch them as they try to catch half a dozen rampant live crickets who are scared out of their wits after being dropped into The Gecko Den. 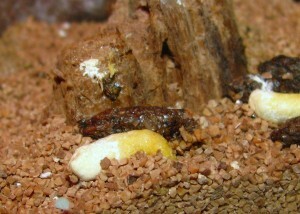 However, they do win in the end as a hungry gecko always gets their cricket. 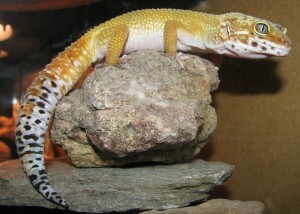 Leopard geckos have been bred into many different color patterns (morphs) over the past several years with the intensely orange-tailed “carrot-tail” being one of the most sought after. Leopard geckos (Leos as they are known in the trade) however will fade in color a day or two prior to their regular shedding – the next day you’ll awaken to a freshly-hued bright and shiny, happy Leo – and as I said, no shedded skin to clean up! With the many varieties available, you will have no problem finding one who accents you home decor. They are known as the consummate lounge lizard as they will lie sprawled out napping seemingly without a care in the world. And you will be too, if you decide to get a pet leopard gecko of your very own. Now, you aren’t skeptical about keeping a reptile anymore right?